I agree with you, Panasonic NCR18650B is awesome! For vaping, unprotected batteries are the way to go. These batts recharge well, hold a charge for quite some time, and last for a few days of fairly constant vaping. I use these in an iTaste SVD with great results. When I connect 10 of these in parallel and get 34 Amps do I then get 20C? The word 'then' has a time connotation. Event 'a' happened THEN event 'b'. The word 'than' usually has a quantity connotation. Container 'a' has more water THAN container 'b'. The other primary use of the word is to exclude - as in the term 'other than'. DK - The word "then" is, for once, being used quite correctly in this question. If you are referring to the answer, you should say so, otherwise you are chastising Myron DesJarlait for something he gas not done, instead of the unknown responder. Don't be coy. You saw and knew exactly to what i was referring. But, to those who did not - i apologize to Myron DesJarlait. You are correct. I came here to educate myself on cells and batteries. Knowledge of cells and batteries and speaking correctly about them seems highly prized around here. When I connect 10 of these in parallel will I then have 20C? Yes. But note that at high discharge rates, that are above 0.5C, you do not get the full capacity of 3.4 Ah. At 0.5C rate, you will probably get only 65% of the capacity. If you let the cell relax, you will get some more back. But not 100%. If you discharge at 0.01C, you will get 100% of the rated capacity. These were a great choice for my electric bicycle, 103.6v 60ah = 296+ safe battery use miles. They are awesome. Stay under 20mph :-). They are so lightweight when building a battery pack. Cheese and rice man, 106b volts!!!!??? PLEASEPLEASEPLEASE PURDY please send my an electrical diagram and pictures, etc. This sounds like the great superbike of MadMax era WINNER FAME. I wanna study it so I can do something similar. Many tank yous for having dared to venture, and many more in advance for your help. Building a 60v. 34a battery for my trike. Using test tube racks to hold the cells. .75" holes .72" cells. Almost perfect. on the back I don't have to worry about size. Sure diy, or go with battery blocks from Shawn McCarthy website green axle. That is about 160 cells in a 16S10P configutation. Don't bother with racks. Just glue and tape them together in a rectangular bundle of 16 x 10 cells. Put a thin insulation (vinyl tape) between each rows of 10. The NCR 18650B seems to offer me excellent energy density that I require. I wonder is it suitable for offering power in all-electric aircraft? How about its safety? 1- never charge above 4.15 volts, and at 4.15 V, do not charge it higher than 50 mA. The lesser current and more time, the more charge you will get. Between 4.2 and 4.15 is about 3% capacity that you will not use. The additional safety is worth the 3% less charge, and also the battery will last a lot longer. 2) use wire fuse for each cell (probably 6A, in case of short). 3) use protection board and balance board (a must, very cheap). 4) use a supply DC to (4.15 x number of cells in series CCVV) charger of good quality (a must - do not go above this voltage). 5) use a reliable AC to DC power supply. 6) let air flow between cells separated at least 5mmm. Thank you for your comment. When working with li-ion 18650 batteries it is very important to understand basics. In this case understanding difference between "Charging" and "Discharging". 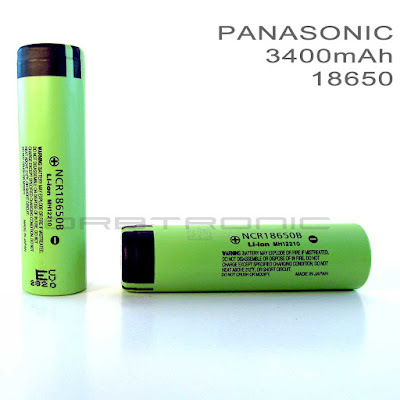 You are free to post your questions and concerns when it comes to ncr18650b or any other 18650 battery. I will be happy to help. Hi Sal, what kind of wire fuse should be used on this cell for a 2C max e-drive? Do you go with 13S or 20S? Which is preferred? I use it in my mod (vapeing) and will it vent if I take 10A from it? It is not cotinuous discharge, 2-3 seconds time perioda/puffs. Anybody? Hrvoje, what is the model name of your e-cig mod? Or how many 18650 batteries it takes? Hi, I want to put two of these batteries to a 100w regulated mod (e cigarette). I want to use it at 45 watts only. So the current needed it will be somewhere between 11 amps when the battery are fresh (>4 volts) and 15 amps when the battery drain to 3 volts. Will two of these handle that with safety? Does it matter if the two batteries are placed parallel or in series? This make 36 Amps a cell !!! Those are amazing !!!!! Did u faced battery heatup issue while discharging / load condition.